American rabbi; born at Erlau, Hungary, May 2, 1844; died in New York March 30, 1896; son of Chief Rabbi Joseph Hirsch Weiss. He was educated in the Talmudic schools of Hungary, including the seminary at Eisenstadt, where he studied under Dr. Hildesheimer. Later he attended the universities of Leipsic and Halle, receiving his doctorate at the latter institution. He assisted Bernard Fischer in revising the Buxtorf lexicon, and was for several years a director of schools in his native town. He was for a time identified with the ultra-Orthodox party in Hungary, acting as secretary to the organization Shomere ha-Datt, and editing a Judæo-German weekly in its support. 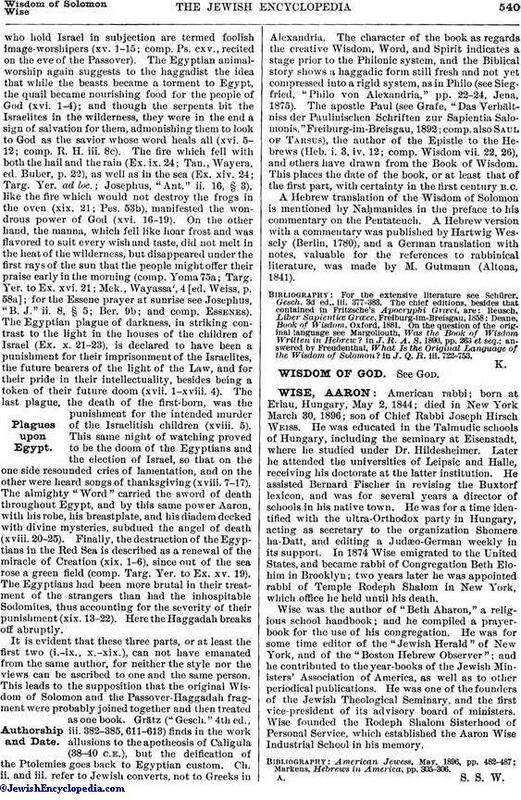 In 1874 Wise emigrated to the United States, and became rabbi of Congregation Beth Elohim in Brooklyn; two years later he was appointed rabbi of Temple Rodeph Shalom in New York, which office he held until his death. Wise was the author of "Beth Aharon," a religious school handbook; and he compiled a prayer-book for the use of his congregation. He was for some time editor of the "Jewish Herald" of New York, and of the "Boston Hebrew Observer"; and he contributed to the year-books of the Jewish Ministers' Association of America, as well as to other periodical publications. He was one of the founders of the Jewish Theological Seminary, and the first vice-president of its advisory board of ministers. Wise founded the Rodeph Shalom Sisterhood of Personal Service, which established the Aaron Wise Industrial School in his memory. Markens, Hebrews in America, pp. 305-306.